I've been embracing my feminine side lately (see this post). I think it has do with the fact that I'm growing out my hair for the wedding in June - after which you can be rest assured that I'll promptly head over to the salon and get a good 3 inches lopped off. I don't like tying my hair or fussing with it, so I'm going to be sticking with an approximately chin length bob. In any case, now that global warming is in full swing and the end of winter already feels like mid-spring, I've been wearing more lightweight shirts and using canvas bags (e.g. the Makr Farm rucksack) instead of hipster-ish waterproof ones. There are some things that I've been wearing/using so much that if you did a proper cost-benefit analysis, I would be coming out way on top. 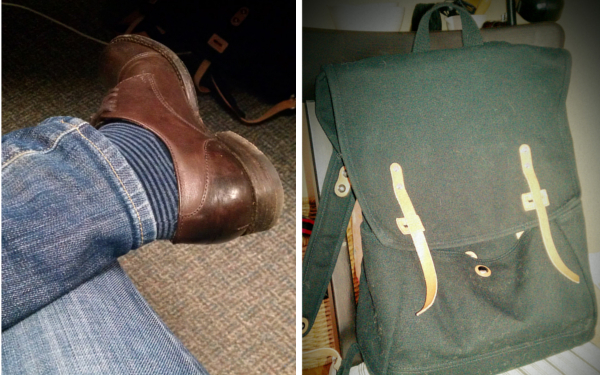 Case in point, I've had those Frye oxfords pictured above since 2007 which I bought for $160. I've worn them about 957 times (I think), got them resoled twice and they are still as comfy and trusty as ever. Frye do make their shoes in Mexico though, so I'm not really sure how ethical or sustainable their production standards are, but I'm assuming that if most people get as much out of their shoes as I do, then there's something Frye is doing right. Which brings me to another point that I've been musing about for the past few months about quality goods, heritage goods and ethical goods. I've been trying to buy more locally made products in hopes that they would offer me some sort of minor consolation about my consumption habits. I'm actually pretty happy to report that most of the locally made/small batch brands that I've experienced (Makr, Earnest Sewn, Primoeza etc.) have lived up to my expectations. I recently bought another J.W. Hulme bag which has turned me into a such a convert that I'm not even sure I want the highly coveted Sofia Coppola bag anymore. I'm a brand loyalist, so once I find something I like that is in line with my beliefs and fits me well, I tend to stick with them even if it costs an arm and a leg (and in most cases, a month's rent). By the way, I also want to add that J.W. Hulme has the most incredible customer service, I can't speak highly enough of them. Every once in a while though, I find myself falling for things I shouldn't (like the floral Madewell shirt above). I still can't bring myself forward sometimes to fork out three times the amount for something similar that is more in line with what I've been trying to achieve. I know that in the long run, I would probably be more contented with paying a higher cost upfront, but honestly, who doesn't like some instant gratification? P.S. : A lot of people found this blog through this post. Jill Wenger recently took some time to respond and I wanted to give everyone a head's up and leave it at that. I'm not one for offensive confrontation unless I'm drunk and the person I'm offending is either a policeman or a night-call ER surgeon. Have a good week everyone!